Brett Halliday’s 1945 novel Murder Is My Business is representative of the many hardboiled crime novels of the 30s, 40s and 50s that are now more or less forgotten. While the hardboiled fiction of people like Hammett, Chandler and Cain has remained in print and gradually gained a degree of literary respectability the works of their contemporaries have not fared so well. 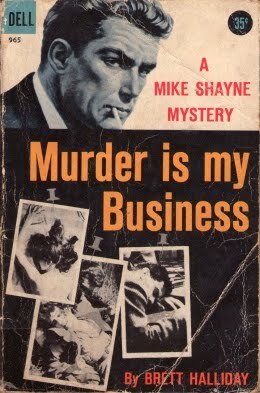 Murder Is My Business is one of Halliday’s Mike Shayne mysteries. These were highly successful in their day and spawned a series of movie adaptations. Private eye Mike Shayne is engaged to investigate the disappearance of a soldier in El Paso. It soon becomes apparent that the disappearance is part of a wider conspiracy that ultimately proves to involve Nazi agents in the US, bogus silver mines, a crooked local election and an old love affair. Mike Shayne is a slightly more cynical character than Philip Marlowe but he still manages to serve the cause of justice, although Shayne likes to combine this with a healthy personal profit as well. The plot is complex but it all comes together quite satisfactorily. the same kind of hardboiled dialogue. But since Halliday published the first of his Mike Shayne novels in the same year that Chandler published his first novel it would be unfair to characterise him as a mere imitator. Halliday does the hardboiled thing pretty effectively and the result is a highly entertaining little book. Paul Féval (1816-1887) was a popular and prolific French novelist who dabbbled in a variety of genres from swashbuckling adventure to gothic horror to crime. His masterwork was the Habits Noirs or Blackcoats cycle, a series of novel dealing with an immense and sinister secret criminal brotherhood. La Rue de Jérusalem (translated by Brian Stableford under the title 'Salem Street) marked the official beginning of this cycle although Féval linked several earlier novels into the series. Like most of Féval’s works the novel was originally published in serial form, in 1868. As you’d expect from a serial novel it’s a somewhat ramshackle construction with numerous sub-plots and endless complications. Like most authors of these romans-feuilletins Féval wrote quickly, had no interest in revising, and often dictated his books. As a result there are inconsistencies and continuity errors, but they’re part of the charm of this sort of fiction. To attempt anything approaching a plot synopsis would be a daunting task. There are kidnappings, murders, fortune-hunters, a pretender to the French throne, cases of mistaken identity, old sins that return to haunt both victim and perpetrator, police spies, duels, brawls, betrayals and unrequited romance. It’s all breathless and melodramatic but with sudden disconcerting switches to broad comedy. In fact the entire book has a certain tongue-in-cheek quality to it. The criminal organisation of the Habits Noirs is a fascinating creation and can be seen as the forerunner of most conspiracy theory fiction. Féval was pre-eminently a writer of popular entertainment with few pretensions to literary distinction although from time to time he did succumb to the temptation to make a bid for literary respectability, without success. His success as a popular novelist was however undeniable. The Habits Noirs cycle was never completed. After losing his entire considerable fortune in a financial scandal Féval found God and turned to the writing of religious novels. 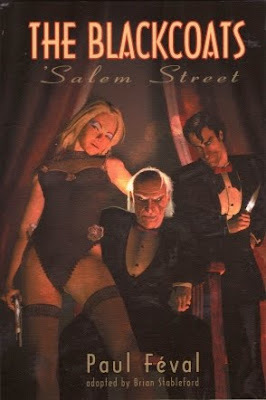 'Salem Street is a bit rough round the edges but it’s fun. Translator Brian Stableford provides an informative introduction to the Black Coat Press edition of this important pioneering work of crime fiction. 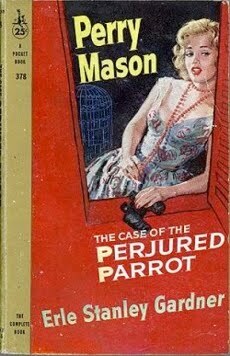 The Case of the Perjured Parrot is my first sampling of Erle Stanley Gardner’s Perry Mason novels. And it’s a pretty enjoyable read. This one was originally published in 1939. It has the kind of outrageous and unlikely but highly ingenious plot you expect from a golden age crime mystery. There’s zero characterisation and atmosphere. Everything depends on the plot, but that’s the nature of this type of mystery and the plot is clever enough to keep things entertaining. A millionaire businessman is found murdered in his mountain cabin, shot at close range with both barrels of a vintage derringer. There’s no shortage of suspects. There’s his wife, from whom he may or may not actually be divorced. There’s his feckless stepson. And there’s his girlfriend, who may actually be his wife. And there really is a parrot, and the parrot really does commit perjury! This is crime fiction with an emphasis on breezy fun. You’re not expected to take things overly seriously. I enjoyed it enough that I’l be keeping a lookout for more of the Perry Mason books. As much as I adore the Sherlock Holmes stories it always saddens me that Sir Arthur Conan Doyle’s other fiction often gets overlooked. He wrote superb historical novels, some great horror short stories (including the one the movie The Mummy was based on, tales of adventure on the high seas and just about every other genre you can think of. And he wrote science fiction. Like The Lost World. This short novel is not quite my favourite Conan Doyle science fiction tale. The Maracot Deep is for my money stranger and more original. But The Lost World, published in 1912, remains the classic story of its type. A young newspaperman named Malone sets out to impress his girlfriend Gladys by doing something brave and daring. And attempting to interview Professor Challenger certainly requites both courage and daring. The eccentric scientist has a famously violent temper and has put a number of journalists in hospital. And he’s in an even worse mood since he returned from his recent expedition to South America. Challenger had came back with an extraordinary tale to tell but unfortunately his supporting evidence had been lost on the return journey and his account was met with ridicule and venomous hostility by his many scientific enemies. Surprisingly he takes a liking to young Malone and invites him to a lecture he is giving. When the Professor tells the audience that he had discovered a lost world filled with prehistoric creatures he is greeted with laughter and catcalls. He throws out a challenge to anyone prepared to set out for South America to establish the truth of his story. There are three volunteers - Professor Summerlee (his most bitter scientific adversary), famous big-game hunter and adventurer Lord John Roxton and Malone whose enthusiasm and determination to impress Gladys got the better of him. And there is indeed a lost world. An immense plateau which seems to have no means of access, but eventually our intrepid explorers find an ingenious way to enter this forgotten land. They find dinosaurs, isolated for millions of years, but other more advanced forms of life has at various later times managed to reach this plateau. There is a primitive human civilisation, and there are apemen. Other lost world tales have more ingenious and more inventive plots but there are two areas in which Conan Doyle’s story stands supreme. 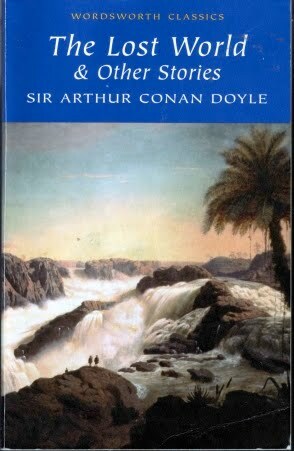 The first is simply Conan Doyle’s skill as a story-teller. The second is characterisation, most importantly in the creation of the extraordinary personage of Professor Challenger. Challenger is not merely eccentric and irascible, he’s violently insane and frighteningly unstable. But he is a genius, and he is immensely entertaining. The Lost World is a ripping adventure yarn. Recommended. The scientific romance was a genre that thrived in both Britain in France from the time of Jules Verne up until roughly the 1920s. It produced some wonderfully strange books, and Gustave Le Rouge’s Vampires of Mars might well be the strangest of them all. It’s also possibly the only decadent scientific romance. The scientific romance was essentially science fiction but the science was often rather fanciful (sometimes extremely fanciful) and the emphasis was more on adventure and on speculation about the future of society and of our species rather than on the science. The writers of these tales came up with some delightfully outlandish methods of interplanetary travel everything from giant cannons to balloons, but Vampires of Mars really excels itself in this respect. Our interplanetary voyager reaches Mars through the power of the will. Or through the power of many wills. The minds of thousands of Hindu fakirs are harnessed by a device invented by a charismatic brahmin and a French engineer named Robert Darvell. The device temporarily stores the volitional fluid thus generated and this volitional fluid produces enough power to send a metal capsule to Mars at the speed of thought (which as everyone knows is approximately half the speed of light). Upon reaching Mars Darvell encounters several intelligent species, each new species that he encounters proving to be even more bizarre than the previous one. The inhabitants of Mars include gigantic vampire bats with near-human intelligence and even more intelligent invisible vampires. Darvell’s biggest problem though is how to get back to his home planet. Fortunately his friends on Earth are working on finding other means of inter-planetary travel. These friends include a British officer in the Indian army, a Polish scientist, an English naturalist and a fabulously wealthy heiress (who happens to be also young and beautiful and in love with Darvell). The narrative jumps back and forth between their feverish efforts to organise a rescue mission and Darvell’s adventures on Mars (where he becomes a virtual king). Le Rouge was certainly inventive and he keeps the action moving along as well. In keeping with the standard practice of authors of the French pulp fictions or romans feuilletons of that era he composed his works extremely rapidly and probably much of it was dictated, and to revise anything or to worry about consistency or continuity would have been a gesture of defeat. As a result the plot is often confusing and contradictory but it doesn’t really matter. What made Le Rouge unusual among authors of this genre was that he was closely involved with the literary Decadence of the late 19th century. Translator Brian Stableford provides his usual informative and thought-provoking afterword and suggests an interesting reading of the book as a kind of satire on its own genre and on colonialism. 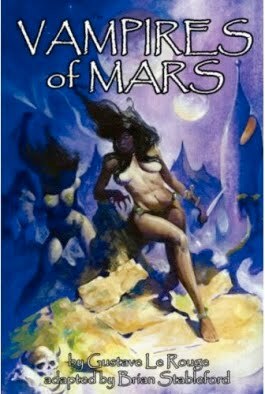 Vampires of Mars was originally published as two books, Le prisonnier de la planète Mars (1908) and La guerre des vampires (1909). If you have a taste for literary oddities and you enjoy the idea of a romance that combines science, mysticism and the occult then it’s certainly worth picking up a copy of the Black Coat Press edition. The arch-criminal Fantômas made his first appearance in print in 1911. Fantômas, written by Marcel Allain and Pierre Souvestre, was followed by no less than 42 sequels. There had been very successful literary criminal heroes before this, most notably Maurice Leblanc’s Arsène Lupin in France and E. W. Hornung’s Raffles in Britain. They were gentlemen thieves, and always remained gentlemen. They avoided unnecessary violence and they had their own sense of fair play. Fantômas belonged to a very different breed. Horrifyingly ruthless and utterly selfish, Fantômas had no hesitation in committing the most cold-blooded murders. He had no real redeeming qualities. He was a very modern sort of amti-hero, of the kind that was to become depressingly ubiquitous from the 1960s onwards. But when Allain and Souvestre created the character he represented something genuinely new and fresh. Fantômas is also a particularly shadowy anti-hero/villain. For much of the first novel he is no more than a menacing presence in the background. The hero of the piece is the master detective Juve who has dedicated his life to bringing Fantômas to justice. It’s an exceptionally difficult task since many in the police force refuse to believe that Fantômas even exists. The novel has a very episodic structure. There is a murder of a wealthy elderly noblewoman, the disappearance of an English lord, a daring jewel robbery in a hotel. There are no clear links between any of these crimes, but Juve has developed the ability to spot the Fantômas touch in apparently random and unconnected crimes. The writing is pulpy and rather clunky and the pacing is very uneven. Despite these faults the sinister quality of Fantômas himself and the sheer scale of his villainy make this a worthwhile read. And for anyone with an interest in the history of crime fiction and of pulp literature it’s essential reading. Louis Feuillade’s 1913 Fantômas movie serial was just as influential as Allain and Souvestre’s novels and it still exists and is available on DVD. John Ashbery’s 1986 translation was issued in paperback by Picador and copies can still be found in used bookstores. 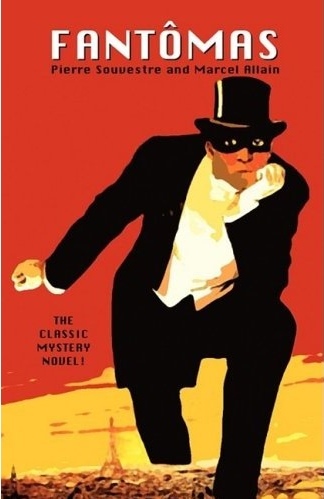 English translations of quite a few of the Fantômas novels are available from print-on-demand publishers. Pierre-Alexis Ponson du Terrail enjoyed immense popularity in mid-19th century France. This was the great age of the romans feuilletons, potboilers published in serial form. Rocambole was his best-known work. The Vampire and the Devil’s Son (La Baronne trépassée) which appeared in book form in 1852 is of exceptional interest. The romans feuilletons followed a definite formula, combining melodrama, sensation and romance. Plot coherence or realism were not essential and these were qualities that Ponson largely ignored. As long as they provided thrills and entertainment no-one was going to complain that the stories made little sense. There is however a complication. The Baron’s mistress has extracted from an unusual promise, and being a gentleman he must keep this promise. He must agree to be her save for a period of 24 hours, at any tome of her choosing. 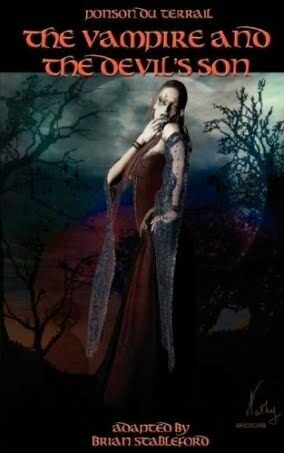 It is particularly unfortunate that the time she dies choose is his wedding night. Very unfortunate indeed - his bride is so upset she leaves his chateau in the middle of the night, catches a chill and dies. The Baron’s adventures now take a veery strange turn indeed. He encounters the mysterious Black Huntsman, who claims to be nothing less than the son of the Devil himself. And he encounters Gretchen, a woman who resembles his dead wife to an uncanny degree, and who proves to be a vampire. But there are many many plot twists still to come, his late wife proves to have more than one double, many of the characters he encounters are not at all who they appear to be, and de Nossac begins to seriously doubt his own sanity. The reader is also left wondering about the reality of the events described, or at least wondering about their true nature. Ponson du Terrail was very much influenced by the gothic fictions of Ann Radcliffe but this is gothic with added weird hallucinatory qualities. Translator Brian Stableford proves both an introduction and an afterword to the Black Coat Press edition and makes some extremely interesting observations in this odd novel. He points out that the author was to some degree constrained by the conventions of the gothic as well as the more general literary convention of his day, and suggests that a modern reader might well interpret the story quite differently as compared to a reader in 1852. Stableford sees the author as being on the verge of several innovative breakthroughs, but being unable to carry them through in a complete manner. A strange but highly diverting little tale, with some genuinely macabre moments. One of the many forgotten treasures of 19th century French gothic. Highly recommended.